The Steampunk No. 1 is part of the Cassandra Elk Strange Art Series of individually customised guitars. The Steampunk No. 1 boasts a leather coverered body and plenty of steam related pipes and gears. Available to buy on ebay Germany. The LTD Devil Girl guitar has a devil girl body made from a molded plastic composite. The 24.75" scale length bolt-on neck is made from maple with a rosewood fingerboard. It has flame inlays and a tail inlay ending at the 12th fret. Hardware is black: a tune-o-matic bridge with string though body tailpiece and an EMG HZ H-4 humbucker at the bridge. Around 100 were made in total. Tom Bingham's Higgs Collider guitar is inspired by the Victorian industrial revolution and the present day conflict between science and religion. Its a Strat neck on a Spanish guitar body, 6 string Electro/acoustic with Telecaster hardware with three way pickup selector switch. Here is Tom Bingham's latest creation called the "VINYL RECORD GUITAR". Tom collects Bert Jansch vinyl and thought this would be a good thing to do with all those records that would otherwise get binned. It took 6 records and a few bits from a record player to create. This wine box guitar by Tom Bingham has a plaque reading "poachers will be shot on first sight and if practicable be questioned later..."
This Tom Bingham's "Double Header" oilcan guitar, partially inspired by "Chickenbone Johns" Castrol oilcan. It can be tuned at both ends and has a clean twangy sound. Tom Bingham's latest addition to his series of guitars inspired by the Star Wars films is built around the Anakin Jedi Starfighter. Tom made it using a Hasbro Body, Westfield neck and Telecaster hardware. Tom Bingham's B-wing fighter guitar. Tom Binghams Millennium Falcon guitar - part of his Star Wars series. This cricket bat guitar was inspired by a 1982 vinyl record cover by Captain Sensible. It has a handy cricket ball attached to the headstock. Tom Bingham's chess board guitar features a complete chess set plus the board. Even the string trees are chess pieces. Amatuer luthier Stuart Boydell from Caerphilly made his library book cigar box ukulele for the Library Wales Express Yourself competition. The soundbox is plywood with a book cover glued on. The neck is red cherry with a rosewood fingerboard (inlaid with mother of pearl). The instrument at the grand final held at the Welsh Assembly Government building in Cardiff, where it was played by Ruth Jones (from the Gavin & Stacy T.V. show). It won the visual art category - you can see Stuart playing it in the video below. The Hofner Fledermausguitarre (the Bat Guitar) was a hollow body prototype/exhibition instrument. The vaguely bat-shaped body is 2 inches deep and has an integrated 4 Watt amplifier with loudspeaker, brown suburst finished spruce top, maple sides with ventilation holes. This was probably the first European guitar with an integrated amplifier - it preceeded the Wandre Krundaal Bikini model. The Bat Guitar was made in very limited numbers in 1960 for the Frankfurt Music Messe (costing 650 DM) but never went into full scale production (probably less than 12 were ever made). This is a step-by-step guide on instructables.com shows you how to make a skatar (a guitar skateboard). 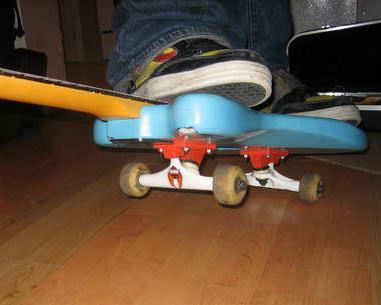 Instructables contributor ntagn33 describes how he took a Squier Jagmaster and mounted skateboard trucks on the back. Then he added griptape to the front, making it a fully functional guitar-skateboard. This 3/4 size bass guitar is made from the KNEX construction toy. It is just about playable, although the neck is so straight that it only works on the upper reaches of the fingerboard. The builder, KNEX-Guy, strung it up with a single string and can get at least 2 tunes out of it, with varying degrees of accuracy. The Alien Custom is a one-off custom made instrument, kept in the personal collection of its maker since it was built in 2006 and used as a show piece. The guitar is sculpted from carbon fibre and finished in a special chrome paint giving it a metallic look. It sold on eBay for 7000 Euros on November 21st 2009. The sale included a laser display stand with built in lights and a motor that revolves the guitar. This a one off customised instrument, made in Holland. The owner calls it the Chop Shop Fantasy. The hardware and material specifications are typical enough, but the wings of the body have been cut-off and reattached slightly offset using metal fixings. I think it works pretty well, the central body pod reminds me of a Wandre Davoli Bikini, or of RKS guitars. This guitar built from workshop hardware shows you can make an electric guitar out of just about anything. The neck is a spirit level, with attached saw and hammer. Paint tins behind the body add resonant chambers. The frets look like nails and are tied on sitar-style. But electrified and played through an amplfier with a bit of delay it sounds OK.
You can see this giant amplifier shaped music shop on Commercial road, Southampton. It is based on a Fender Super Champ, and of course the knobs go up to 11. The giant amplifier is inhabited by resident luthier Jamie 'Razor' Goatley and his assistant Wesley. Jamie says that the red jewel light even comes on at night.